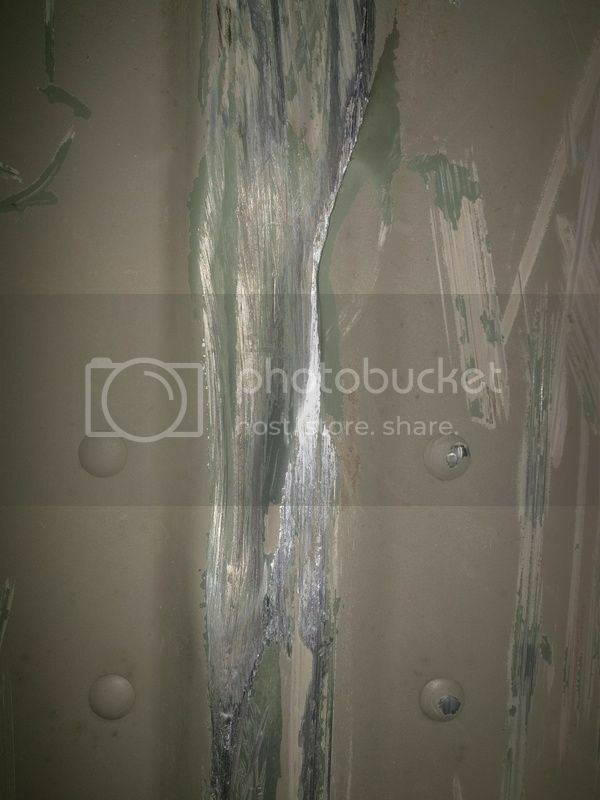 I have a dent or two in my Tracker 1648 hull bottom that I'm pretty sure is effecting my performance. Loosing about 5 mph at WOT. Previously with my '94 Johnson 50/35 I was getting upper 20's and now I'm in the low 20's. Only other thing I can think of is water logged foam, but I replaced the foam in late 2013 with the blue stuff from Lowes. So I doubt that is the issue. Only way for me to find out is to pull my floor, which is doable but would involve a lot of work. I want to clean up the dents, particular a bigger one that is in the center chine about 16-18" from the stern. I'm guessing that is the main culprit for my performance drop. Thinking of ways to get it smoothed back out without trying to beat the dent itself out, which I think will only cause more issues. I'm thinking of using JB water weld to pack the dent and then sand it all down as smooth as possible once it cures. Not sure how well it would hold up though. Have also considered filling the dent by throwing down some welds and then grinding it smooth. But my hull is pretty thin, probably .080 or less and welding it is a major PITA!! Have also looked at the aluminum flux rods to fill in the dents. What do you guys think? Would any of those options help with my issue? Terp - can you post some photos of your concerns ? 5 mph from a dent? I'm suspicious of that theory. Do you think it's causing aeration and sending dirty water to the pump? Interested to see what you come up with as a learning experience for myself. Do you think it's causing aeration and sending dirty water to the pump? Not sure if that's the case or not. Would think I would be getting some cavitation if so, which I do not experience. 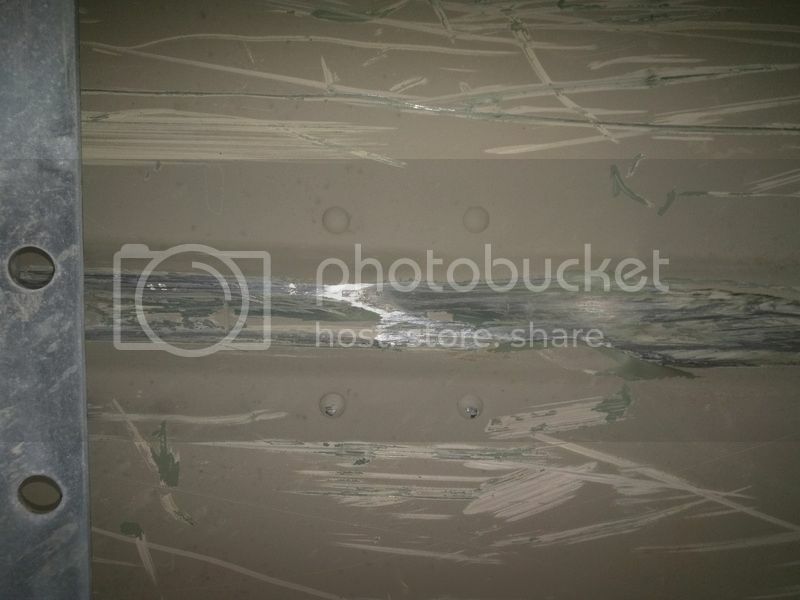 I think the bottom of my hull just isn't smooth like it used to be and is causing excessive drag while on plane. I'll get some pictures when I have the chance of my hull bottom. The dent in the center chine is fairly significant. There are a few others here and there that may or may not be causing some drag as well. I can't imagine it's water logged foam because with 3 guys and hunting gear I was getting better top end then I am now without all that weight. Nothing else has changed with my setup either. Motor runs great and the impeller is properly shimmed and in good shape along with my liner. My boat does run better with a passenger in the back and I fished by myself 90% of the time last year. So I may be over reacting a bit, but it definitely doesn't have the performance it use to. I just have a feeling there has to be something else going on. I'd like to see the pics. Another thing to check is to make sure the gate is operating properly. Check it out of the water and make sure you cannot manually move the gate from open/forward to closed/neutral and that the gate is opening all the way when in forward. For what it's worth, I had a bunch of barni's on the bottom of a boat a couple of years ago, lost 5 MPH on the top end, I can't see how a couple of dents will do the same to you. bunch = 6 sq ft on an 18' hull. Depend on how bad the dent is, might put a straight edge on the bottom of the boat to see how much hook you have. When eyeballing the bottom of a boat you normally don't notice hook as much as a big dent but they both hurt top end especially on a 40/28. Post some pics. Only other thin I could think of you might check you motor height, I've seen the bolts back of just enough to let the motor slip down and that will slow you down. Motor height is good. It's on a static transom riser and can't go down any further. There might be a little hook right at the transom, but it's only in one spot and maybe 10" worth of the transom length. The rest seems nice and straight. Here are some pictures of the dent. It's on the middle chine about 14-16" in front of the transom and jet foot. The dent itself is about 6" long and the width of the chine. Best pictures I could get for now. Sounds like you are plowing when you are alone in the boat. Looking back at your build, you have quite a bit of weight up front including yourself with stick steer. PTT would be ideal but you could try raising the motor with the tilt pin one hole when fishing alone. Thanks. And yeah, it definitely plows when alone in the boat. But with a passenger, it still isn't what it used to be. I tried adding weight to the back while fishing alone, but it was more trouble then it was worth. I also tried raising the motor up one notch, but nothing but cavitation. I'm OK with the plowing with just me in the boat, but would like to get back the performance I had before with a second person in the boat. Just trying to figure out if there is anything I can do. If not, it'll be fine and I can live with it. It took me a few rock hits, 2 holes and a destroyed foot before I learned that my boat isn't a 4x4 for the river. Wish I'd have been a little more careful in the beginning and my hull would be in much better shape. Oh well, all a part of jet boating. Sounds like you need a thicker hull. I've had some riveted boats and I would never go back just to thin especially for a jet boat you plan on running shallow where some hits are inevitable. You could try and push the dents out somewhat, I imagine the hook is what doing the most depending on bad it is. Do you have a tach? If not, order one of those cheap tiny tach copies off of ebay http://www.ebay.com/itm/DIGITAL-TACH-SI ... yG&vxp=mtr. A friend of mine had the same motor and it spun your impeller at 5300rpm. I read that you had a dirty carb issue and it doesn't take long for a lean cylinder to smear a little aluminum across the rings. A more stout hull would definitely be nice. Planning to have a good one built with UHMW or K5 as my next boat. Will probably be a little while before that happens though. Any feasible fix for the hook? Yes. And at WOT mine runs about 5300-5400. Motor is in good shape. Best I could think of would be to try and carefully push the dents out. That thin aluminum it can be hard to do that without creating a crack at a crease.